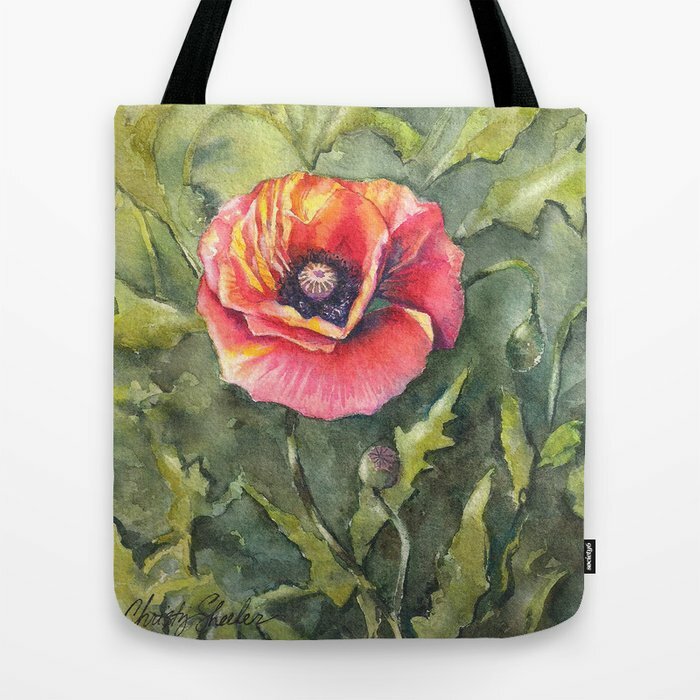 It brings me much excitement and joy to share my artwork is uploaded and available to purchase online. 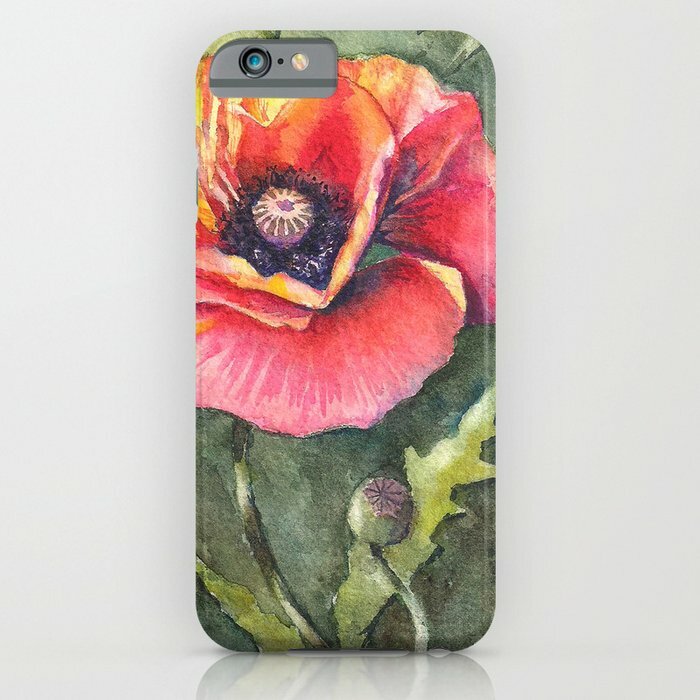 Christy Sheeler Artist on Society6: A great selection of art design items!!! 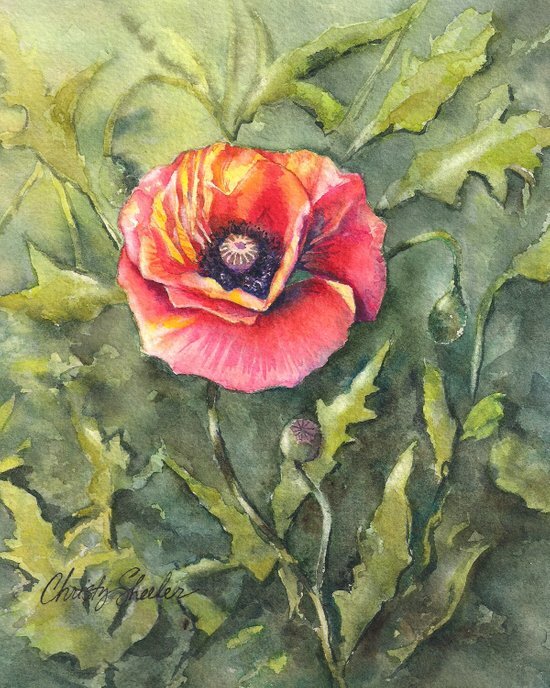 My originals are available for purchase on Etsy ChristySheelerArtist now. 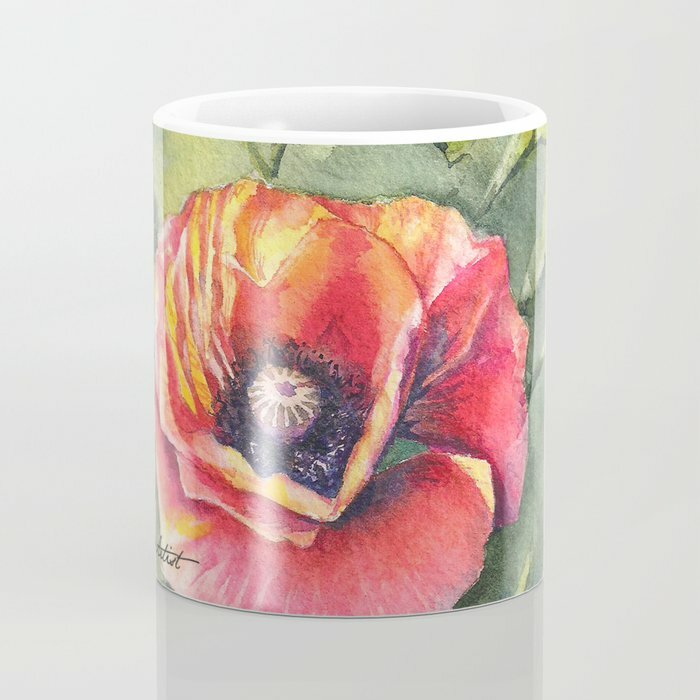 This one, titled Poppy Single hasn't been added to the Etsy shop yet...but soon. In time, I'll have my own website and ready to have them purchased there. Well, that is reality as of today! This will be a project in the making...my work is cut out for me. 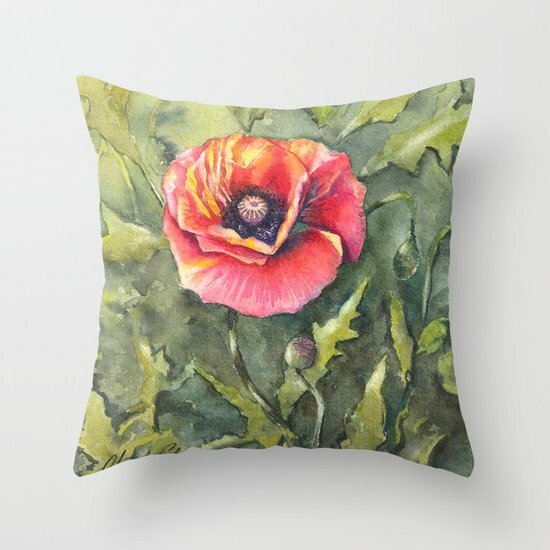 If there is a painting you've seen here and would really love to have available on the Society6 site, please comment or send me an email! You never know when I'll have something new I can't wait to share!!! The inspiration for these paintings began with a neighbor's garden! Lynn has one of the most green thumbs on our block. As I've shared before, I keep a close eye tuned to the gardens throughout our little town. Many a trip, toting one of my kids somewhere and back again, means I can spot the local views for inspiration. In the past, Lynn has been great with me taking photos of her sunflowers as well. I remember years ago...photos gone with a hard drive crash...taking some photos of magnolias she was growing in her living room. Last summer, I visited Lynn's garden when the early evening sun brought out their beautiful glow of oranges and yellows. The petals are like tissue paper, so delicate and thin. For my artist's eye, these are just too lovely to resist! I've looked forward to painting them and found they were worth the wait. There are a total of four paintings in this series. I'll be showing photographs from the stages of completion but not always from the same painting. 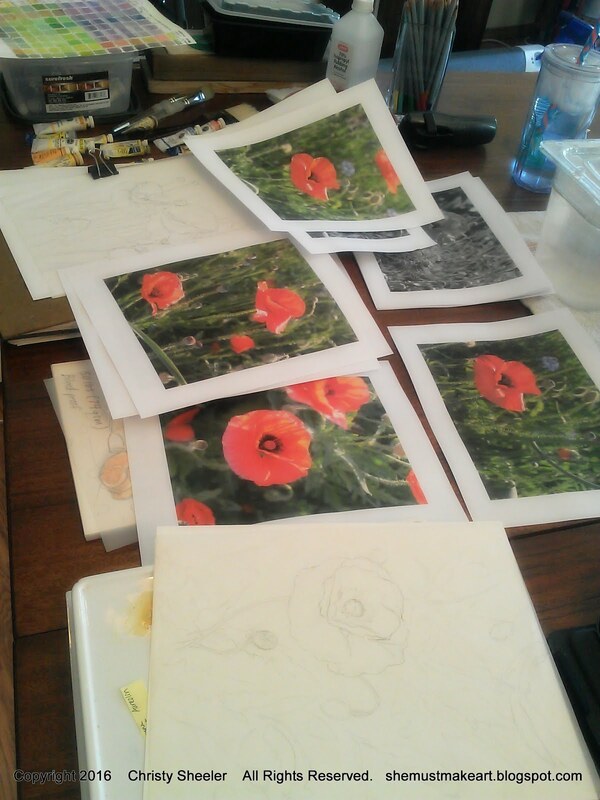 As I've shared in passing a photo on my phone of my current works in progress, many people have commented that poppies are their favorite as well. 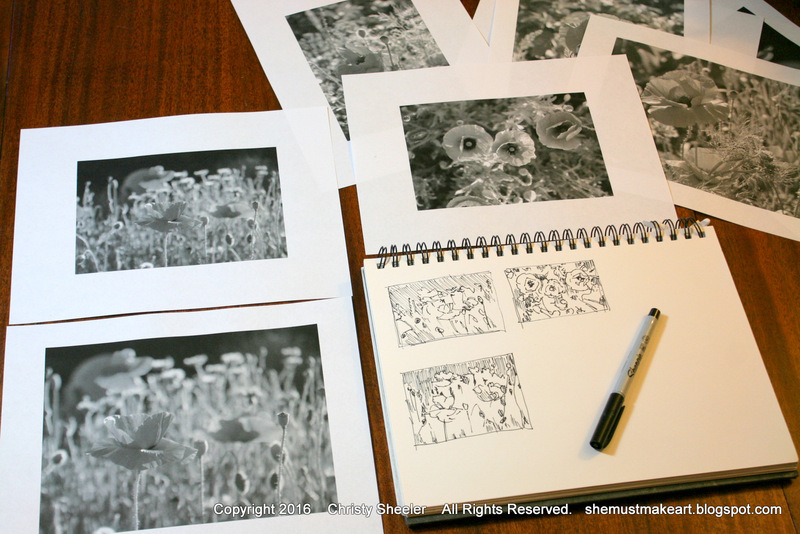 With photos sorted and favorites chosen, I began the process with the value sketches. The composition is very important in the planning stages. I must admit I broke some composition rules in two of these paintings. 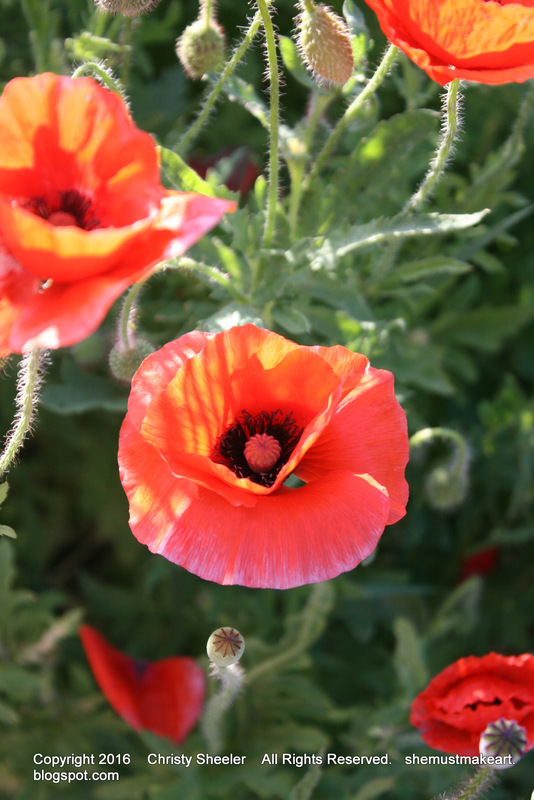 I did not place the focal poppy where it ought to be BUT I believe I was able to pull it off. This should not be my regular habit; the unusual composition appeals to me. My art critic husband is strongly drawn to the more traditional compositions. I did not want to do the value studies/composition planning! Like brushing teeth...it doesn't take that long and it's painless, but it sure prevents future problems. I have been aware that these little quick sketches are important. I wanted to get right to the painting sooner. It wasn't torturous and I will begin implementing this in my process on a regular basis. It's really not THAT bad. 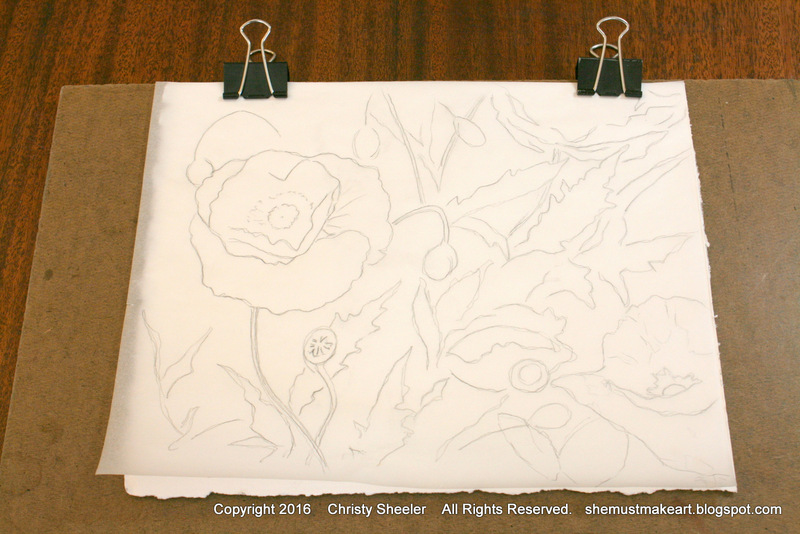 I have been making my sketches directly on tracing paper. Maybe I ought to be sketching on drawing paper in the sketch book first. What thought do you have? I suppose a sketchbook is a longer lasting record and easier to flip through later. Well, I made the sketches on tracing paper. I had purchased a thicker tracing paper and this was my chance to try it out. I think I prefer the thinner weight. Is it because it's what I am familiar with, that's undecided. Sketches are transferred with graphite paper onto the 300 lb. watercolor paper. This saves the paper from multiple eraser marks and pencil lines indented in the paper. If you have not made your own graphite paper before, you should give it a try. You only need a few items and you most likely have them on hand now. Comment and let me know, I would do a how-to demo to show how it's done. This is just a quick shot of one of the steps taken after a painting is finished. The paintings spent a few days in the flattening process. My method is dampening the back of the paper, layering in towels and weighting down with heavy books. The next step, they needed to be signed. One of them had such a dark background, the black pen would not have been easily visible. This is the only time I use white paint. ONLY. That's just my personal standard. I like how it turned out and might change how I sign paintings from this point forward. Have you ever learned something totally outside of anything you thought possible? 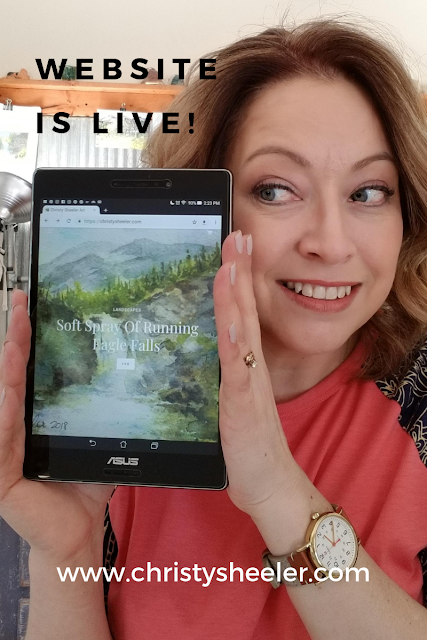 Sharing my art studio adventures is quite a challenge. My mind is so full of new information and at times it feels overwhelming. My 2015 goals have been reviewed. With a new list of goals for 2016 (some carried over from 2015) I've got my work cut out for me! I'm not very organized in my methods for tackling these goals. I'd say spontaneous and sporadic would describe my method... Are you ready for the run down on how this all came to take place in the art studio. Hang on! 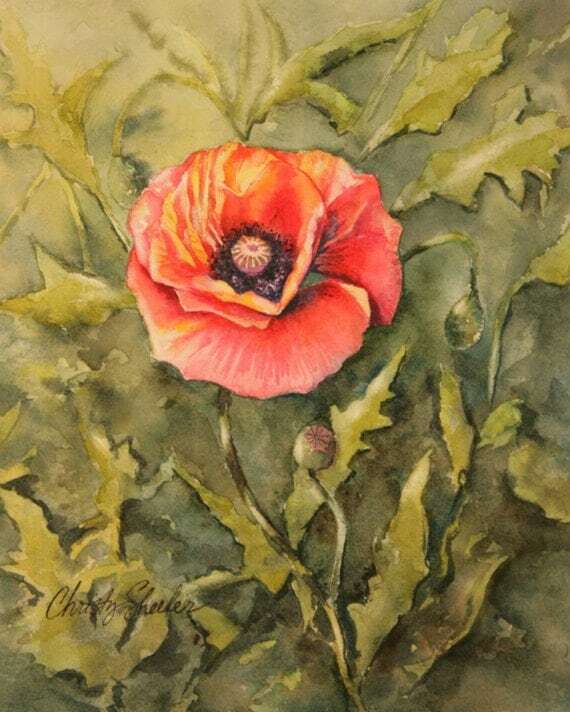 A snapshot from the video Watercolor Background for Poppies. My Pinterest boards read like this: Artist Inspiration, Photography, Christy Sheeler Art Studio, Logo and Business Card Design, Blog Tips, Etsy Website Online Selling...and the newest board is Video Tips. That one is just an itty bitty board, but it will grow as I search out the stuff I need to know. 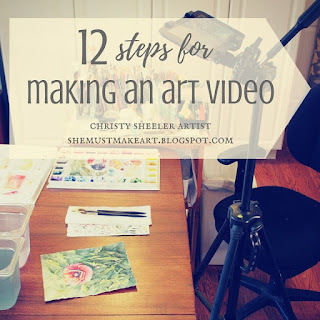 In the past, I've taught some beginner watercolor lessons locally. It was SO much fun! I was incredibly nervous at the start!! Once I got the feel for what to teach and how to teach, it was so rewarding. 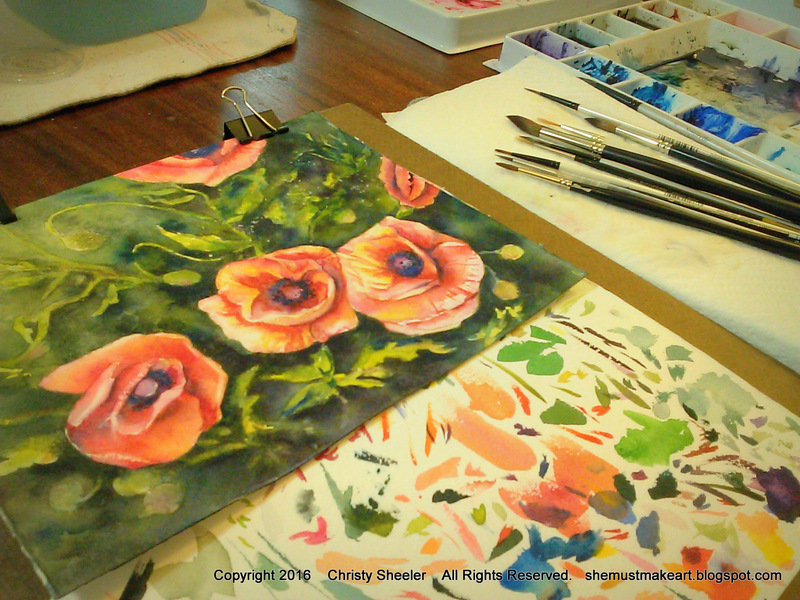 I've taken a break for now to get my own art flowing again... but I was amazed by the interest to watch me paint. There's a curiosity and I guess I do relate; I enjoy watching others paint as well. Currently, there are four paintings in various stages of completion. Today, I'm showing the most recent progress of number 4. Sorry... right now, that's its title. It's definitely an unusual composition. I didn't want to mess with the original photo layout. I took a risk and broke some rules with this one. The petals themselves have given me a challenge but it's still coming along. There are layers of color built up in the background. It appears green at a glance, but I've been adding blues and violets. Sometimes, that bold color gets a little lost once it dries. In the back of my mind, I'm considering cropping this for a better composition. That decision will be a tough one. I'll wait to see what the end piece looks like. There are certain areas that I enjoy more than others. Two of the three centers are very close to being complete. 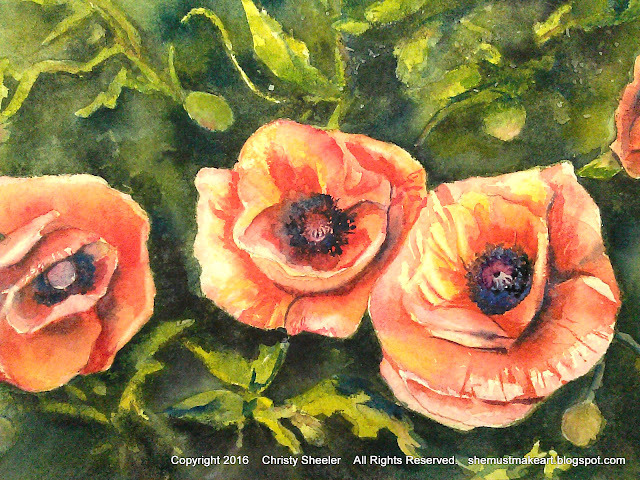 The poppy on the far left has more to be done in defining the petals, shadows, and center. The fine details around the center still need attention. Salt crystals still lay on the paper's surface where I wanted more unusual texture. The salt will be brushed away before I can continue to work the background. I'm keeping this post a bit shorter so I can get back to the painting sooner. 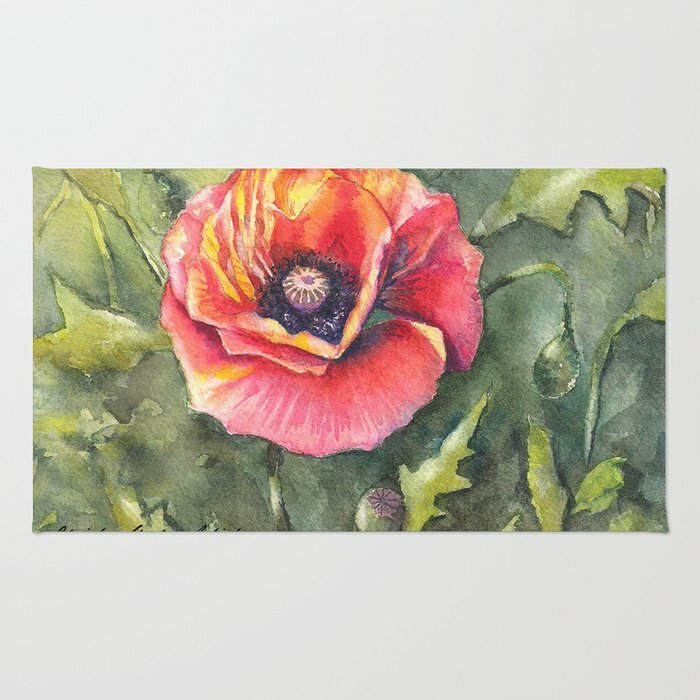 The photo below shows my favorite area...lovely places of pale orange against I may choose this type of composition for Giclee prints. 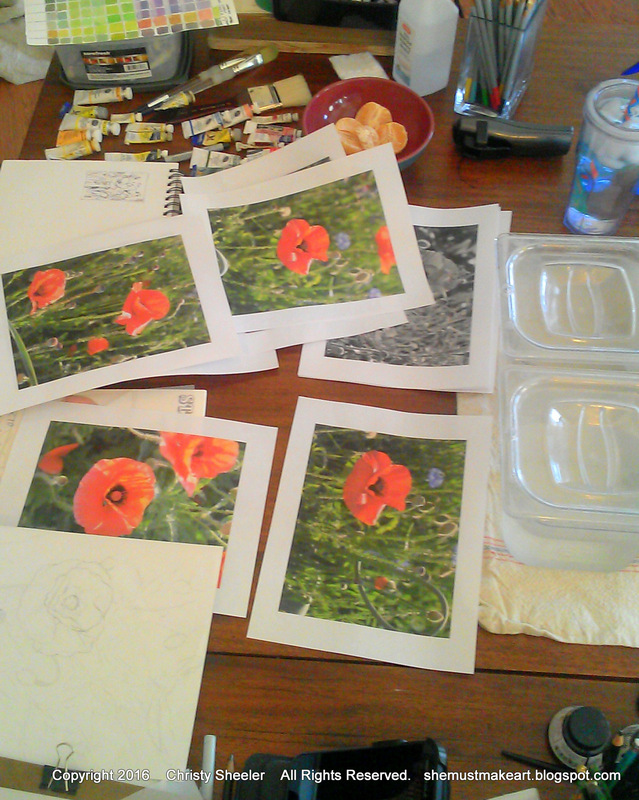 The past few weeks have been spent easing back into the art process with reference photos of poppies. Winter here continues and I am content to be inside, comfortable and warm. Even so, I do feel a bit of cabin fever. The Gurney's seed catalog came this week. In a few months it will be time to start planning the garden. So while winter carries on, I'm focusing on garden beauties. 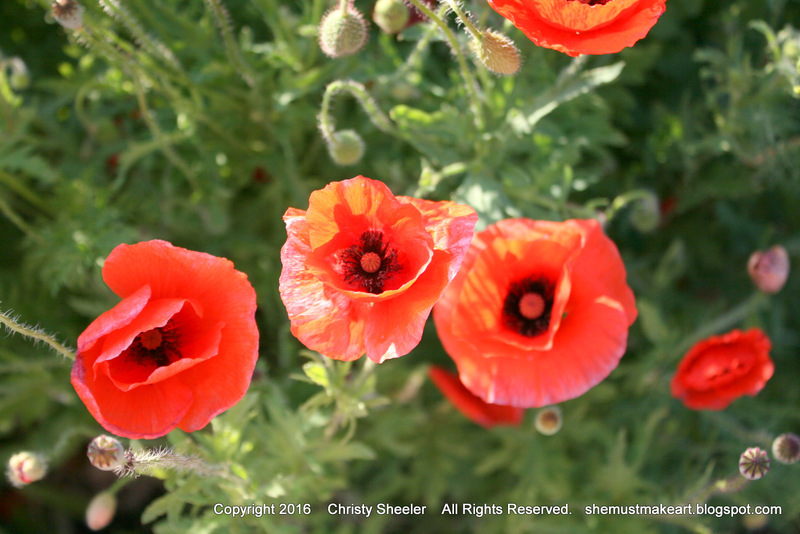 Their petals are as delicate as tissue paper, sunlight defines each bit of crinkle in the petals. 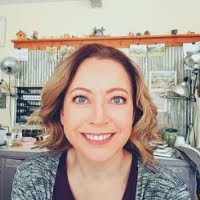 In all my nearly 30 years with art (ouch, that's a while! ), there are several things I have avoided doing. Skipping over a step in the planning and executing process is not the best habit to start. In college, I avoided Art History 101. I was able to take several other classes like photography and drawing. Without the Art History, I could not move on to take pottery or painting. Foolish me! Advice to that college student me: Go for it anyway! Well, the other thing I've avoided is the thumbnail sketch. It's not a sketch of a thumbnail. It's just a small sketch (think business card size) with the basic composition, shapes and values. I've dreaded it and gotten by all these years without it. But I've wondered how following through and doing it could help me improve my work.